But those plans have now been kicked to the curb as well. 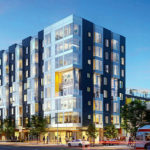 And next month, SoMa Development Partners will seek approval for a 10-story building to rise up to 105 feet in height across the site, with 121 apartments over 2,200-square-feet of retail space at the corner of Geary and Masonic and a garage for 7 cars as designed by RG-Architecture and freshly rendered below. As we first reported as well, the project team is planning to leverage the new HOME-SF program (we first revealed) in order to build beyond what’s zoned. And as such, 30 percent of the new units (36) would be offered at “affordable” below market rates. That intersection has always had bad feng shui. No mans land between the Inner Richmond, Japantown, North of panhandle, Laurel. A few generously sized and pretty pedestrian overpasses might make it a bit less forbidding for humans. Regardless of the approach, this intersection will have to be reimagined sooner than later. The worst of the worst feng shui! It would be better if Geary were more underground – if the tunnel ran from Collins to Lyon (or even Baker), then the whole hilltop could be reconfigured to be more user-friendly – for cars as well as peds. I’ll never understand this city’s aversion to tunneling throughfares under the hills. “Erhmehgerd it favors speedy car traffic!” Well, yeah – and speedier bus traffic, and all while freeing up surface space for local uses. Same goes for 19th, from Judah to Wawona could be underground, and imagine how much nicer (and local user-friendly) that entire stretch of 19th could be. Maybe it’s something to do with being expensive. Your idea will be more valuable for downtown area where land is extra premium and traffic is especially bad. 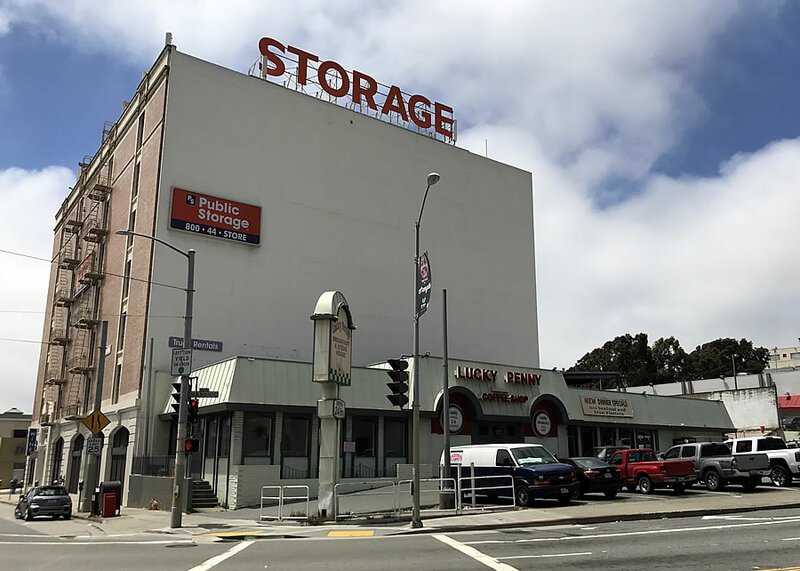 To tunnel Geary from Van Ness to Market might be sensible. 19th ave is neither. I dunno about your Feng shui comment – Trader Joe’s seems to be doing pretty well and corner lots are generally quite favorable. Trader Joe’s may be doing good business (they typically do, no matter where they are), but there’s often a line of cars on the street waiting to get into the parking lot. It’s a bit of a mess. I agree. The Masonic intersection is one of the nicer intersection along Geary. The overpass at Webster is one of the worst. Geary is most divided between Japantown and Fillmore. There I walk freely between Target and Trader Joe. This is a great development. Very suitable for the Geary corridor. The 36 BMR unit is especailly welcome. you have to walk up, usually along a very curvy ramp which makes you walk twice as far (at least) to cross the street. I call that pedestrian unfriendly, to the max. This intersection is a roadway underpass rather than a pedestrian overpass. I don’t think it’s that bad. It’s bad if you think of it coming from Geary westbound or along Masonic. But if you think of it as the end of a pedestrian strip along Geary into the Inner Richmond, it’s more pedestrian friendly on that end. And it would be convenient for USF students. It’s absolutely a problem intersection. That’s why it’s currently being rebuilt into something better. The new intersection should be a lot nicer for pedestrians. This intersection is in the Masonic Avenue Streetscape Project. i suspected that this development would be supersized. it had to go higher to top that ugly public storage building. so many amazing views if your unit is on the northwest side. too bad the design looks so forboding. i imagine the public storage building will be the next to go. As has so often been the case lately, the earlier proposal is superior to the revised version. Agreed. Until the bulk of Geary is more consistently built out to even 4 stories (let alone 5 or 6, and as opposed to the current 1 and 2 story wastes of space), then it’s not appropriate to put a 10-story building here – let alone on a hilltop where it will dominate the view from the surrounding areas. To summarize: Until the buildings are taller, we shouldn’t build any tall buildings. I mean come on, the stupid Storage building currently “dominates the view.” Who cares? so, to summarize: There’s already crappy development, so we don’t have to worry about making it crappier. Pretty much. The original design had /some/ hints of uniqueness. This looks rather cookie-cutter. 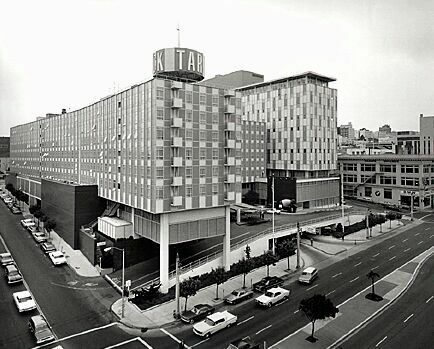 Then again, par for the course in SF from the 50s on. Don’t worry, hordes will sing its praises around 2070. They thought that about the 50s boxes and everything built in the 80s (a la the “Richmond District Special”). 70 and 30 years later, respectively, and they are still eyesores. This could be back office space or an institution – in terms of design. Nothing engaging here, nothing that adds to the feng shui of the intersection. The architects aren’t even trying – hire the firm that is designing the California Street housing development (Cal Pacific complex). Unfortunately, Planning wants a redesign even of that initial wonderful scheme. But, but, where will all those Trader Joe’s shoppers park then? Coming up Pine onto that fork in the road will be even more of a nightmare. But, that is progress right? They should have some sort of parking management that’s not “let the cars all line up on the street until there’s room for them”. Completely agree that’s a big issue. Maybe if SF had a few (or a lot) more grocery stores this wouldn’t be a problem. Having essentially only these 3 chains, one normal (Safeway), or quirky/sort-of-affordable (TJ) and one $$$ (Whole Foods) there is zero competition so every store is packed to the gills at all times. They know we’ll wait and suffer because most shoppers would only really shop at a single one of those chains anyway. Given the very real food desert problem, and the very real traffic dangers many grocery stores have right now due to this scarcity, SF should offer tax incentives to any grocery store to come in, especially if it turns a vacant space or empty lot into a store. The former Bell Market on Post and Franklin has been sitting empty for 10 years at the base of a 15 story condo tower. It even has a garage. WTF. 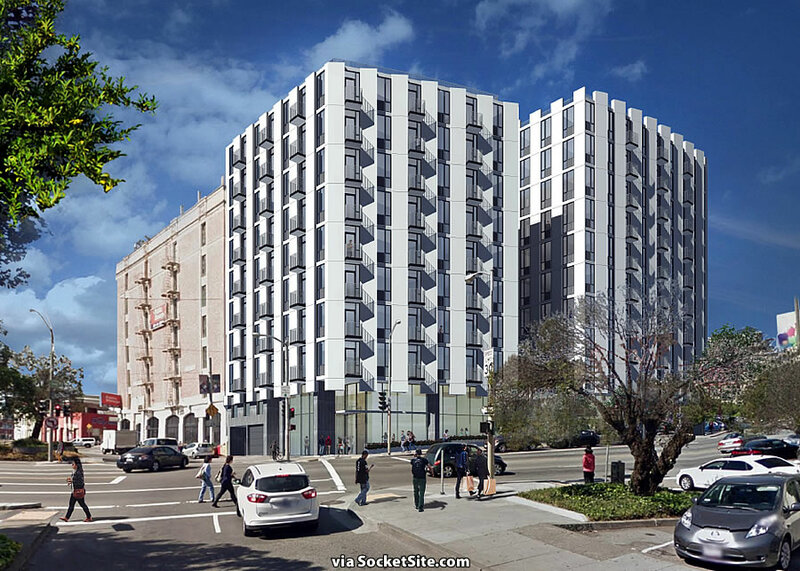 Kudos to the development team for tapping into the HOME-SF program — the added density and on-site affordable housing is a win-win and will do much to improve that difficult intersection. That immediate area could easily support over a thousand new units were the adjacent MUNI yard and Target City Center to be redeveloped. One slow step at a time! Quantity does not surpass quality relevant this particular development. The design will get massaged — the chances of this getting built as shown without feedback from Planning and the community are slim to none. That said I would take the increased unit count and the extra 36 affordable units the additional height triggers over the original 7 and 8 story iterations any day of the week. It ain’t pretty, but we need housing. Kudos for finding a way to build more. Assuming it gets built. Reminds me of this building in Oakland….oh wait thats a prison. I always reference that when talking about 8 Octavia’s east-facing facade. Agreed it’s pretty ugly but at least you can avoid the parking lot queues at Trader Joes! It looks like a Kaiser facility in Fresno. If you’re talkling about the Kaiser Hospital in Fresno it isn’t close in any way! I appreciate the upsizing but I do think the old design was more interesting. Maybe they could do something stylistically like the old one but closer to the size of the new one? Rock on for housing. But kind of reminds me of [this]. 7 parking spots for 121 apartments – are you serious? Goodbye neighborhood street parking for current residents. I could see most of them being for zipcars or citycarshare. So what? No one has the right to free parking. In what world is 7 parking spots for a 121 unit condo ‘too much parking’?! I drive through that intersection on the regular, traffic’s not bad there at all…. Reducing the number of parking spaces makes the housing more affordable. And climate change is here. Time to transform the way we travel. No parking only makes sense for singles. Families in the city still need a car because it will take forever to shlep kids to schools and activities. I have 2 kids. I am so tired of this idea that all parents want cars cars cars because: kids. Some of us would rather have fewer cars, so that our kids can have safer streets, and maybe even some space to move around. I rarely drive with my kids, and take transit or bike with them daily. If I wanted to shuttle my kids around in a small boat I’d move to the 99% of America that’s built for that. All of which is to say: love the low parking ratio, hope it works out. The design is kind of hideous but hopefully it gets refined a bit. Neighborhood schools would go a long way toward reducing the need for families to have cars. Not all parents want cars. But many parents in SF must have them if they have one kid who was assigned to a school in the Excelsior, and another kid who was assigned to one in the Outer Richmond. And you live in the FiDi. You don’t get a choice in SF where your kids go, so it’s asinine to expect most families to have zero option for a safe place to keep their car. Thus, housing that comes with no parking excludes most families, just to serve an impractical bike agenda, or a fantasyland transit one, since instead of building subways, we take 10 years a pop to build third-world-style “BRT” lines that shave 5 minutes off a 4 mile stretch. I pass several schools during my morning commute and see hundreds of kids+parents walking or biking to school. A car is not required to educate children. Now social engineering programs that force kids to enroll in schools too far to walk is a different story. I am for it. Could it be prettier? Sure, but you want housing and people living in it, especially BMR, correct? Function over form then. As long as the future residents can get to work via public transport in a reasonable manner, be able to shop for food and other essentials, you’re fine. It is much better than the Lucky Penny restaurant – which has been there since I went to high school in the vicinity back in the late 1980s. When prices flatten at a high level, builders will still keep building and adding supply. As prices flatten, it becomes a much worse deal to buy a $2M condo. But building and selling a $2M condo into a rising market and building and selling a $2M condo into a flat market are nearly equivalent. It’s not until prices fall below the point where it’s economically worthwhile to build that the supply spigot gets shut off. And during a rising market, existing sellers actually make money by waiting and holding their property off the market. But during a flat market, existing units are just getting older by the month while shiny new units are coming online. So a flattening market adds selling pressure to existing units as well. 7 parking spaces for 121 units is just awful. I realize that SF hates cars, but I think most people want at least half a chance for a parking spot. Otherwise, if you have kids or need to unload a lot, it is a nightmare. I actually drive by this area quite often and it is impossible to find a good entry/exit point for the garage with a lot of cars coming in and out. This is a weird and large intersection, and this particular corner isn’t the best. Who knows,maybe Target across the street may decide to lease out its parking lot spaces on Masonic during its off-hours. These residences will attract those who don’t find parking to be a necessity or issue. 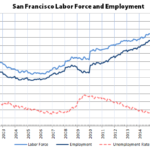 There are numerous apartment rentals in the Inner, Central, and Outer Richmond districts with parking. With those rentals, there are landlords who are willing to rent to college students. No one is forcing such people to live here. You may be surprised to find that there are many people who actually embrace the virtues of urban life and would love to live in a building where they are not forced to subsidize someone else’s parking. > where they are not forced to subsidize someone else’s parking. What? Do you even know how money works? If this was built with 1-2 deeded spots per apartment (which was common as recently as the 90s and works amazingly for housing built back then) you, as a super cool urbanite who wouldn’t be caught dead in a car, would be able to lease out your parking space for $200 a month to some guy who lives around the block. Or some other person in your building with 2 cars. Or, if a building is rentals, then they will be leased as an add-on to all those terrible car driving people. This is easy money for your owner, and would allow them to make the same profit with lower rent. In no universe are you subsidizing parking for other people, unless you seek out a building with a deeded spot yet let it sit empty. But that’s stupid. If you can’t handle renting it out, there are plenty of units without parking that you could get without trying to take away all parking for others. great job on height – one thing that makes western neighborhoods interesting are the scattered 6+ story apartment blocks that punctuate corners and add building diversity. Also, the project is probably reflecting on some long-term possibility of upzoned housing on the Muni yard. And this being the crossroads of two of the most major north and south muni routes, as well as very bikeable (soon! ), make the parking ratio make sense — I also suspect that subterranean parking on this parcel would be prohibitively expensive. I hope the unit sizes come out with a good mix — not dorm room tiny, but not showboading as 2+Bed “family housing”. There is enough demand for single professionals who are not in the tech set (architects, public service, non-profit, graduate students) that want to live on their own but are now bunked up in houses and 2- or 3-bed apartments. You would think that at a major “crossroads” there would be effective and efficient mass transit. Not a bus that takes forever to crawl across town. Mass transit. Other cities have it. Without a doubt, this is an unfriendly intersection for cars, peds and bikes alike, especially this particular corner. Too bad the developer couldn’t buy the TJ site, level it, and incorporate the development into that site as well, with a new TJs and other retail. Too bad this intersection doesn’t have a mass transit station. I guess you have to go to another Transit First City. I wonder if any thought has been given to the high winds in this area? Anytime I walk past the storage building I have to take off or hang on to my hat if wearing one. A 105′ building right on the property line might funnel even more wind down to sidewalk level. It could make walking the sidewalk there very unpleasant. Totally agree with concerns over lack of parking in this project. Beyond ridiculous! That lot is already used for Trader Joe’s overflow parking and is maxed out. To build 121 units with just 7 dedicated parking spaces is idiotic.